Call me late to the party, but I just found out Weezer will put out their eighth LP, Hurley, on September 14 (is it me, or does it seem like they just put out their last album a few months ago? You have to applaud their work ethic). 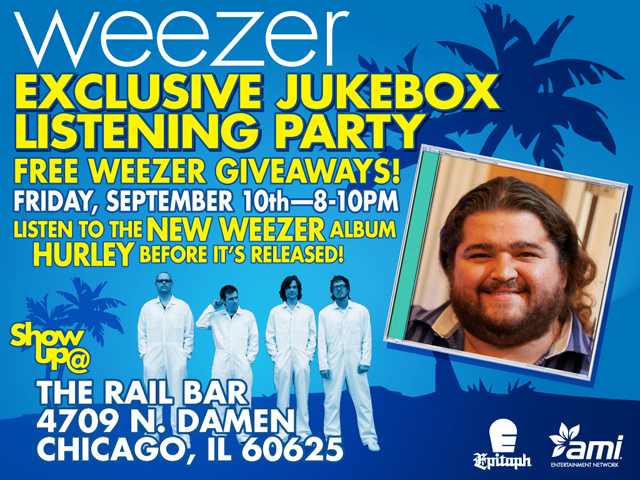 After receiving the below flyer for a pre-release listening party on Friday, September 10 at The Rail here in Chicago, I had to do a double-take because the big ol' face on the album cover staring back at me was none other than that of Jorge Garcia, a.k.a. Hurley from Lost. I'm not quite sure why his face is being used as the cover and why the LP's titled Hurley, but it will probably pay off because really, who doesn't love Hurley from Lost? 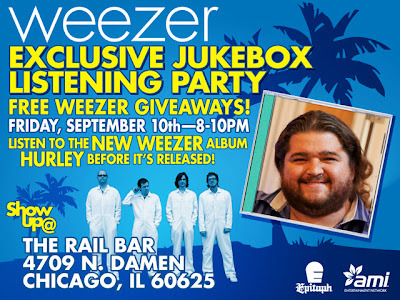 If you're as intrigued as I am, be sure to check out the party, where you'll not only get to hear the album but also partake in "free Weezer giveaways."